If you’re reading our blog on this beautiful Saint Valentine’s Day, we think you should stop immediately (like 5 seconds ago), step away from your iPhone and go snuggle up with your love connection. Seriously, do it. Our musings on romance and travel can wait. If you’re reading this sometime after the great lover’s holiday, please enjoy these few fun stats for the destination marketer about finding new love and the modern traveler. Just for the heck of it, we asked a few questions about romance and travel on our soon to be released The State of the American Traveler Survey. The results paint an unexpected picture of Americans hitting the road in search of love. As it turns out, if you’re an American looking for a new romance on a vacation, we have some discouraging news for you. Your chance of success isn’t all that good. While we may all have secret dreams of “things happening in Vegas that stay in Vegas,” finding a new partner on the road seems to be a little harder than expected. Our survey shows that last year a little over twenty percent of us have left on a vacation in hopes of making a new romantic connection. 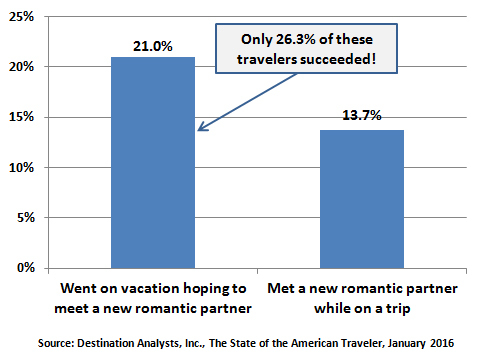 But, alas, only about one quarter of these impassioned travelers (26.3%) found success in meeting a special someone. To be blunt, in most of life this success rate would be considered abysmal. If a high school student scores 26 percent on a Calculus test, they fail. Remedial Algebra here we come. In Major League Baseball, a player batting .263 is sent down to the minors, or dumped completely. On Tinder, whose ego would not be bruised if they knew they got only one out of four right swipes? We don’t mean to take the wind out of your romantic sails, as there is good news in our research. We all know travel is a powerful aphrodisiac, and despite the fact that three out of four traveling romance seekers strike out, serendipity isn’t dead. Coincidental romance still happens, as overall, 13.7 percent of us met a new romantic partner while on the road last year. This means that over 10 percent of those with no expectations at all for travel romance got lucky (with a new person) on the road last year. From a purely numerical standpoint, with hundreds of millions of travelers exploring our great country, we declare this to be very Happy Valentine’s Day news. As an aside, it should come as no surprise that romance and travel is still, for the most part, the domain of the young. Millennial Generation travelers are nearly three times as likely to meet a new partner on the road as are Baby Boomers. Where do we go for romance? Overall, the top destinations we think are romantic are not tremendously surprising. We asked American travelers in an open-ended question (meaning they could write in any answer they wanted) what single American destination was the most romantic. The list of top destinations that emerged is sprinkled with fabulous cities and traditional honeymoon spots. 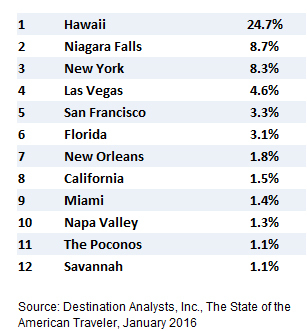 The top twelve destinations are shown below. Who wouldn’t get lost in the romantic possibilities of any of these fantastic places? Wherever we go looking for love, though, hope does spring eternal; and travel romance can be a new start as well as a cure for a bad relationship. Amazingly, nearly one fifth of American travelers (17.2%) took a leisure trip “specifically to get away from someone” last year. While some may find this unsettling, to the hopeful romantics here at Destination Analysts, this only confirms the old folk wisdom that you don’t need magic to disappear, just a destination. The staff here at Destination Analysts has had a lot of fun these last few weeks watching our beloved town prepare for its part in hosting a very successful Super Bowl 50. But alas, all good things must end. The party has wrapped. Workers are taking down the last remnants of Super Bowl City and the last straggling, high-rolling visitors have taken off from SFO. The circus isn’t all over yet, though, as the media and several of our grandstanding local politicians now seem hell bent on branding the event as a financial failure. Television news stories are pleased to hand the microphone to any business owner who perceives the event did not fill his or her pockets. Businesses benefiting from the hundreds of millions in visitor spending are nowhere to be seen. A small cadre of chotchkie vendors who sell their art on the public streets near at the Ferry building were displaced by Super Bowl City. A movement to spend half a million bucks making them whole is now the cause célèbre of San Francisco’s fringy political elite. This local silliness will hopefully end, but when we saw the national media start piling on, it seemed time for a response. Take a minute and read this interesting take on the Super Bowl’s economic impact from Mother Jones. This is a disappointing piece of journalism. Yes, the economic impact numbers around this type event are often overstated, but the Super Bowl was without any doubt a huge net benefit to our city’s governmental coffers. Given the numbers floating around in the media, it seems likely that whatever San Francisco city government spends (the part not reimbursed by the NFL) will be returned at least 4-5 fold when all taxes generated by the event are tallied. The article is full of factual errors. The February occupancy rate in San Francisco does not hover around 90 percent–try 77% for the last three years. The displacement effect these “experts” talk about is way overstated. This line of thinking would only make sense to someone who thinks one-dimensionally and knows little about traveler behavior. Of course there will be some displacement, but ask yourself this. If you wanted to visit San Francisco, would you be likely to completely cancel your trip because room rates were high on a particular five day period in February? No, you would most likely visit during a different week. Additionally, many of San Francisco’s hotel guests (especially in the off-season and during mid week) are business travelers. If they need to come meet with clients or do sales calls in the city, will they simply cancel the trip due to the Super Bowl? No, of course they won’t. They will simply work around the issue and come do their business before or after the event. This is common sense. Demand for a destination does not express itself the way the naysayers suggest. 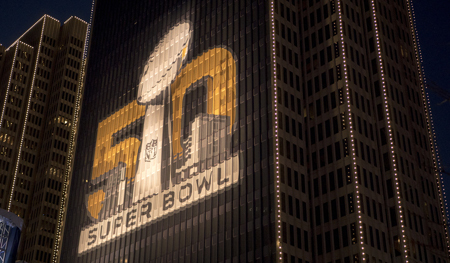 The Super Bowl will strongly and positively impact hotel occupancy (and rates) far out on both sides of the event. The number of hotel rooms filled is, of course, only half of the story. Room rates soared during the week and the 14 percent hotel tax goes straight back to the city, as do taxes and fees related to all the other spending that went on in town. When these taxes are submitted, San Francisco will have millions of new incremental dollars waiting to support vital city services. These would not be there without the game, and are far in excess of what we paid out as hosts. In a rational conversation, we’d call that a good investment. Please keep in mind, I’m not saying the city negotiated well with the NFL. Maybe the terms of the deal could have been better. That’s an entirely different issue. However, arguing that the Super Bowl didn’t benefit the city financially (and in a big way) is ridiculous.